LANSING — With Michigan’s redistricting process, wage laws and marijuana legalization hanging in the balance, the 2018 battle over ballot proposals is just getting started. But it’s already attracted more than $7 million in contributions, according to new campaign finance disclosures. Some of the committees pushing the proposals have gotten the majority of their money from nonprofit organizations that don’t disclose the sources of their revenue. According to new reports that cover fundraising through the end of 2017, three committees have already gathered more than $1 million in support (including both direct financial contributions and in-kind contributions of goods or services). Another committee is now on the verge of $1 million. 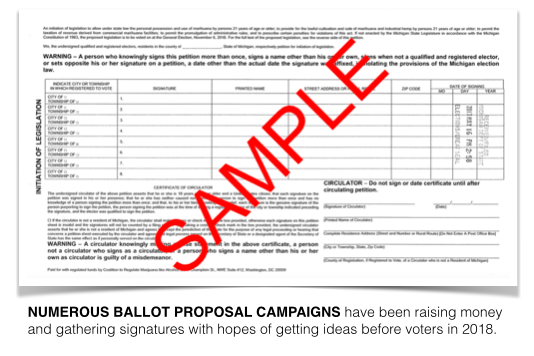 Some of the committees are trying to initiate legislation that state lawmakers could approve without sending the language to the ballot. Others want to amend the Michigan Constitution, meaning their proposals would be up to voters. Follow The Money: The majority of the money Clean MI has raised has come from a Lansing-based nonprofit organization, Fund for Michigan Jobs, which doesn’t disclose its donors. The organization has given $951,000 to the campaign so far. MI PAC, a PAC connected to Lt. Gov. Brian Calley, has made $301,224 in in-kind contributions. Capital Sales Company, of Hazel Park, has given $100,000, as has businessman William Parfet. Follow The Money: The Associated Builders and Contractors of Michigan continue to drive the campaign to repeal the state’s prevailing wage, which sets wage standards for certain publicly funded construction projects. The organization, which represents the commercial construction industry, has given $1.2 million to support of the campaign. Protecting Michigan Taxpayers hopes the Legislature will approve its language without the proposal having to be put on the ballot in November. Follow The Money: The Washington, D.C.-based Marijuana Policy Project continues to provide heavy support for the coalition that wants to legalize marijuana in Michigan. The project has provided $174,205 in support. The project’s foundation has provided $188,807 in support. Smokers Outlet, based in Troy, has contributed $250,000. Follow The Money: The campaign to bring an earned sick leave policy has raised nearly $1 million in support. Its heaviest backers have been two Washington D.C.-based nonprofit organizations: Sixteen Thirty Fund and The Fairness Project. The Sixteen Thirty Fund says it “helps donors and social entrepreneurs advocate for change on the issues most important to them.” It’s given the ballot campaign $530,717 in support. The Fairness Project says it promotes “general social welfare of community through the use of education around ballot measures.” It’s given the ballot campaign $206,500 in support. Follow The Money: Before October 2017, Voters Not Politicians hadn’t had an individual donor give a financial contribution of more than $15,000. On Oct. 28, however, the group reported receiving $150,000 from an East Lansing-based nonprofit called Beckwith Constitutional Liberties Fund. According to a filing with the state, the fund’s purpose is to maintain, protect and advance for “all persons the provisions of the Bill of Rights and other civil rights and liberties.” The organization has previously given grants to the American Civil Liberties Union and the Student Advocacy Center of Michigan. Of all the active ballot proposals, Voters Not Politicians has had the most individual donors, having received more than 7,000 individual contributions as of Dec. 31, 2017. Follow The Money: Another ballot proposal committee, Raise Michigan, has provided $297,648 in funding for the campaign. The Restaurant Opportunities Center, which advocates for restaurant workers, has also been helping fund the campaign. Various groups connected to the center have provided $272,775 in support for the campaign. Follow The Money: The Michigan Building and Construction Trades has been the top donor behind the campaign to keep the prevailing wage in law. The group gave $167,250 to the effort in 2017. The Mid Michigan Electrical Alliance provided $59,650 in support in 2017. — Promote The Vote, a ballot campaign to expand voting rights in Michigan, launched at the end of October. The group didn’t report any financial contributions in its first campaign finance disclosure but did report $30,058 in in-kind contributions. Of that total, $29,408 came from the American Civil Liberties Union of Michigan. — Healthy and Productive Michigan, a campaign to oppose marijuana legalization, launched in November. It reported receiving $150,000 on Dec. 26 from Smart Approaches to Marijuana Action, a nonprofit organization based in Virginia.